The Puerto Rican Crested toad is a small toad (2-4 inches long), with the female being the larger of the two sexes. Coloration is brown marbled with a yellowish-tan or white color, and darker raised lumps along the back and legs. Males show more yellow than females on their back. Females are larger than males, and more robust. They have horny ridges on their head and their toes are webbed. The range of the Puerto Rican Crested Toad is the north and south coasts of Puerto Rico and British Virgin Islands. The habitat of the Puerto Rican Crested Toad is wetland ponds, pools, ditches, forests and rocky areas. Puerto Rican Crested Toads are a nocturnal terrestrial species that live in excavated burrows and semi-arid rocky areas in evergreen forests. 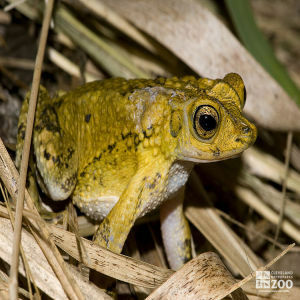 Puerto Rican Crested Toads use seasonal ponds during the rainy season to reproduce, and return to the rocky limestone areas after laying their eggs in long black strings. It takes about 18 days for the eggs to mature into toadlets in the wild. Even though reproduction is sporadic it occurs throughout the year.